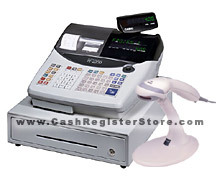 Casio TE-2200 Scanning Electronic Cash Registers at Cash Register Store. The Casio TE-2200 scanning cash register offers many advantages at a low price. First, scan up to 2000 individual barcodes. For a majority of businesses, 2000 barcodes is sufficient for their current inventory needs. The TE-2200 as mentioned below has flash card technology, offering many benefits. Included in the scanning package is a Metrologic MS-9520 laser scanner. The scanner comes standard with a stand, is triggerless (just slide items by and scan them), and has a 6-12 range on the laser beam. Scan items quickly, and move your lines more efficiently with this cash register package. The new TE-2200 Casio cash register features flash card technology. Utilizing flash cards gives the cash register operator 3 distinct LOW COST advantages. Advantage 1: Save the cash register program to a flash card as a secure program back-up. Advantage 2: Save sales reports to the flash card at the end of day to interface to your PC for easy report integration into Microsoft Excel. Advantage 3: No need to buy expensive cash register software programs to send sales data to a PC. All you need is Microsoft Excel. The Casio TE-2200 standard features include high speed thermal receipt/journal printers, a heavy duty metal cash drawer with media slot, 25 standard department keys, and 2 RS232 ports to interface added perhiperals. Yes, get many of the higher end Casio TE-3000 features at about half the cost!